CamPermanent is your personal digital security center software! Why buying a digital recorder if your PC can do this work and much more? With the permanent recording functionality you can record videos in all sizes and length. Record from all your cameras nonstop around the clock. Adjust the video filesize so that the video contains always the last 24 hours, last 8 hours, last 3 days, etc.. If the selected videofilesize is reached the video is overwritten from the beginning. Thereby the video contains always the last minutes, hours, days from the current time backward. CamPermanent supports webcams, netcams (IP-cams) and all video devices which are working with an up to date driver for Windows. All functions are working for all connected cameras parallel! 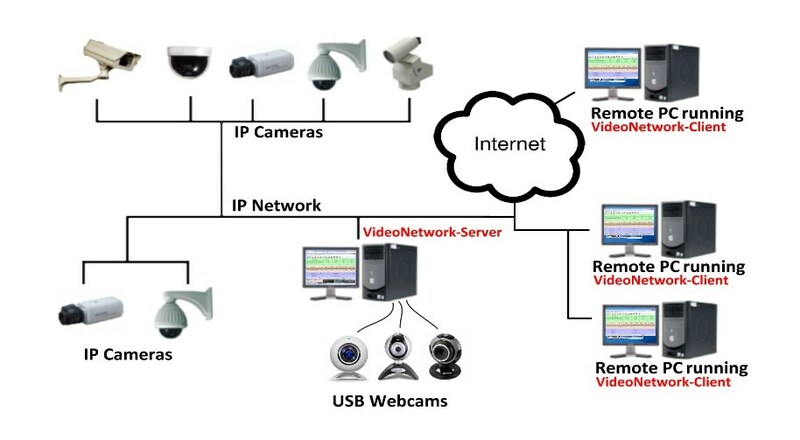 Additional CamPermanent includes a Network Server Client functionality to send the video from all cameras from one server PC to all connected client PCs (RemoteCam) and it includes a Webserver for direct access of all camera videos per simple HTTP request! From CamPermanents point of view the cameras are divided into 3 groups. Netcams (IP-cams) which are accessible through their IP-address. These are cameras within your LAN, WAN or from the Internet. CamPermanent supports Netcams running in the still picture mode and Netcams which are streaming their video in the motion-JPEG (MJPEG) and in the MPEG-4 format! RemoteCams - These are all cameras which are receiving their video from a further instance of CamPermanent (CamLAN or CamUniversal). With the integrated Video Network it is possible to send and receive the video from all cameras which are running at a further instance of CamPermanent. All cameras of the first two categories could be a RemoteCam. So you could view all webcams connected to PC1 on all PCs connected to your network. Like a professional digital recorder CamPermanent has the ability to record nonstop from all your cameras! CamPermanent uses the DirectShow component of DirectX for the standard video recording. So you could use all in your system installed video and audio codecs and all installed video and audio devices for the video recording. Additional CamPermanent supports a timestamp into the video. This timestamp could be the current time/date a usertext and additional a logo bitmap. This standard video recording generates AVI video files in contrast to the permanent video recording which generates video files in a proprietary format! But these videos could also be converted into AVI. The Video-Network is used to view all cameras running in CamPermanent at further PCs. These PCs must have network access to the PC running the software. They are connected to the local area network or over the Internet. One PC is running the video-network server. To this PC all cameras are connected. On serveral other PCs the video-network client is running and connected to the server. Every client PC can use all cameras which are connected to the server PC as a RemoteCam.